Hi everyone! 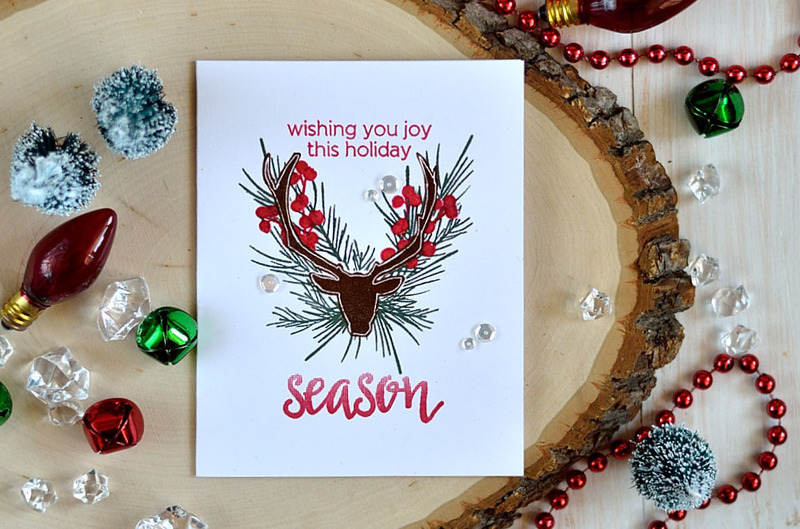 I’m on Altenew blog today sharing yet another one holiday card. I’m still on holiday cardmaking mood for several reasons. First – it’s never enough holiday cards in my stash and even after I sent out all planned for this year I continue making them. Because why not? I still have my holiday stamps out, I still have ideas I didn’t have time to made into cards. So continuing making them now gives me some more holiday joy plus I already have something ready for the next Christmas (and it’s never too early to start preparing for the next Christmas). 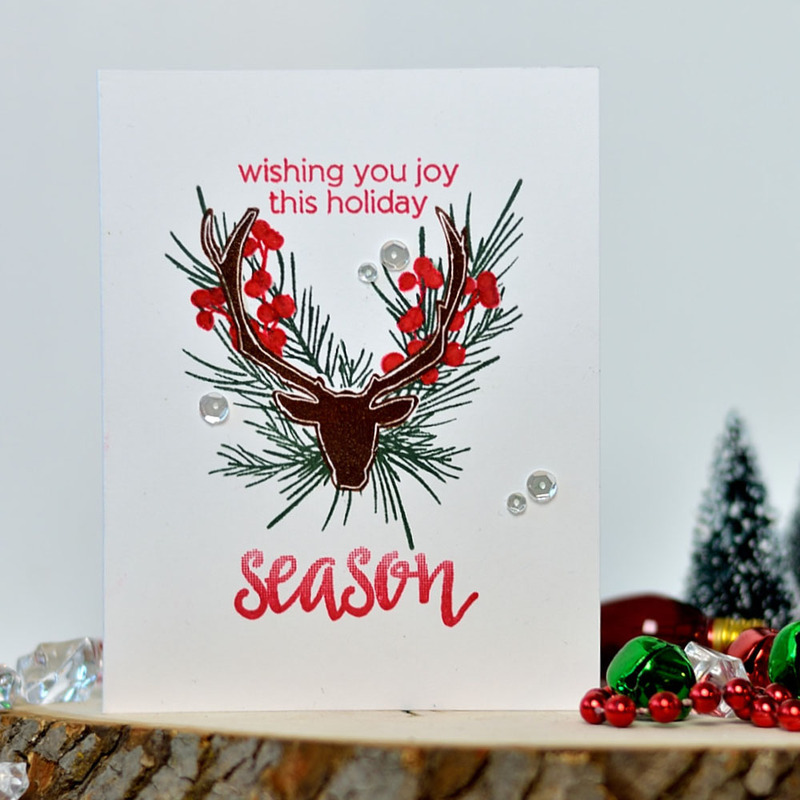 Today I want to share a simple card made using several Altenew holiday stamp sets. I’m keen on decor and there are several decor items I hope I’ll have one day. One of those is a antlers decor piece (of course I want them made of wood or something, not taken from a deer). And while I’m still looking for a real one I decided to make it on a card. This card was very easy to make. First I stamped a dear head from Festive Silhouettes set using Espresso ink in the middle of a Classic Crest Solar White card base. I also made a mask for this stamp out of masking paper and applied it onto the stamped image. 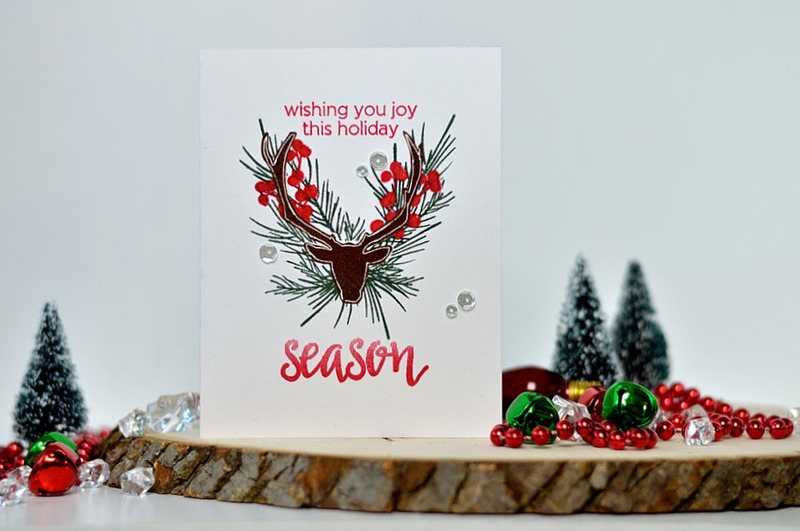 After that, I stamped several berry twigs from Poinsettia and Pine set using Ruby Red ink. And colored them with marker. To mask off berries from following stamping I covered them with embossing ink using embossing marker and clear embossed them. Pine branches from the same set were then stamped around the head and antlers using Evergreen ink. The sentiment from Halftone Holidays were stamped using Ruby Red ink and several clear sequins finished off the card. What a great idea! 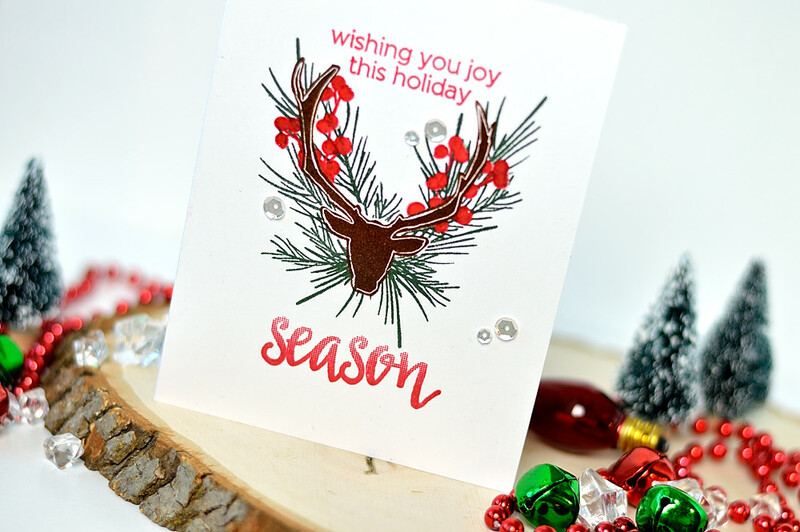 The overstamped pine branches look fab… it’s a very stylish card. Love it!